When you have a Atlanta Hardwood Floor, you have a durable flooring option that lasts a long time. As one of the first flooring types ever used, hardwoods have a classic look and feel that bring warmth to a space as well as a luxurious feeling under the feet. Smooth and silky, luxury hardwoods are both durable and beautiful. While hardwoods are durable, there are things that can work to destroy it over time. But a well maintained hardwood floor will last throughout the years. One of the best ways you can take care of anything you own, including your floor, is to avoid certain activities that damage it. Here are a few things you can do to keep it in great shape. And as always, if it's time for your flooring to get a little professional attention, you can call on our floor refinishing experts here at 1st Quality Floors. Avoid allowing sand and dirt to stay on your floor. These grainy substances are hard enough to scour the surface of your hardwood floor when pressure and friction is applied during walking. With kids and or animals in the home, you'll have plenty of traffic that can scrape and dull the finish off the floor. Having everyone remove shoes when they come in and keeping the floor clean goes a long way to keeping the hardwood floor in great shape. Avoid moving furniture without using protective felt or other moving materials under the furniture first. Never just move furniture along the floor without putting something in between that will keep the floor from scratching. Avoid letting any liquids sit on the surface of the floor. Every home has spills and splatters now and then and your hardwood can stand up to a lot of these. But if the liquid soaks through the protective finish, it will absorb into and stain the wood. 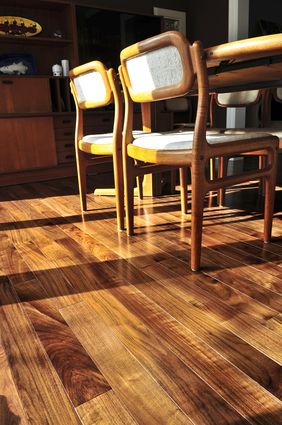 Avoid direct sunlight on your hardwood floor. Where the sun spends a lot of time on your floor, you'll see fading. This can't be avoided unless you filter out the direct sunlight first. Drapes, curtains, or even decorative window film or tint can be applied to avoid this problem. Be careful when cleaning. Avoid any harsh substance that can eat away at the finish of the floor. All you need to clean a hardwood floor is a little bit of soap and water. A damp mop should be used. If too much water is used, you'll need to be sure to get it dried up so it's not sitting on the floor for any length of time or it can soak in and cause discolorations or stains. Don't allow pets to go on your hardwood flooring. Their claws and nails scratch the floor and food bowls or containers will get liquids on it. Keep your pet's nails trimmed and place food on other flooring types or protect the feeding area with a mat or tray. Keeping your hardwood floor in top conditions means it will last you many more years. And that's one of the best things about this flooring type -it can be refinished several times before it needs to be replaced. If your hardwood floor is ready to be renewed, give our Atlanta Flooring Company a call here at 1st Quality Floors for expert care and expert services at affordable rates! If you are looking for Atlanta Hardwood Floors then please call 678-615-7799 or complete our online request form.